Note: This branch at Mont Kiara is now closed. Head to the outlet at Great Eastern Mall instead. A while ago, I experienced a massage at Energy Day Spa at Great Eastern Mall, Ampang. Whilst I enjoyed it, I didn’t like going there, because traffic is killer and I didn’t want to be all zen and relaxed after my massage only to have it all undone by the traffic. So, I have made the Mont Kiara branch my regular and I love it! Energy Day Spa, as the name implies, has various spa packages that includes facials and body massage. They use Swissline skincare products in store and also are the distributors of the premium salon based skincare line. I don’t go for facials however. I go for their body massages which I find consistently quite good and relaxing. 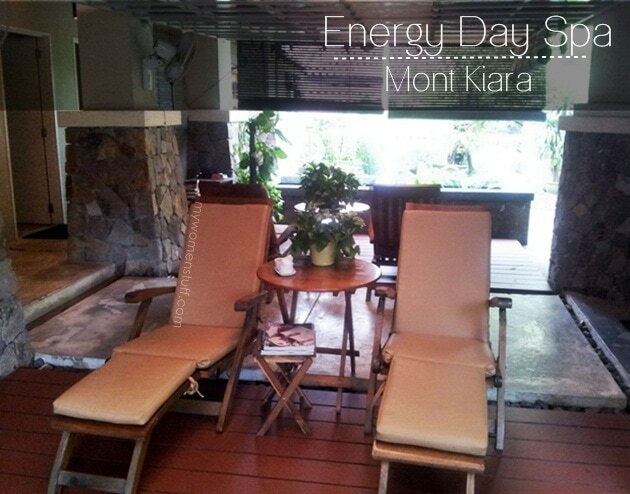 The Energy Day Spa at Mont Kiara is at Damai Sari Mont Kiara, a small building next to the condominium of the same name, and located in a quiet cul-de-sac. The best part is that parking space is ample, and traffic is relatively light getting in and out of the area. Compared to the spa at Great Eastern Mall, the one here is relatively small. It is however, quiet and comfortable, which is what I prefer. After you choose your treatment, you are handed a locker key. Your shoes are taken away and you are provided with slippers, and you can then change in the changing room into disposable undies (for body massage) and a bath robe. You have a locker in which to store your clothes and things and you can keep your locker key with you at all times. Head out to the relaxation deck, where you can pause for a while to relax, with a cup of hot red date tea and a cold towel. 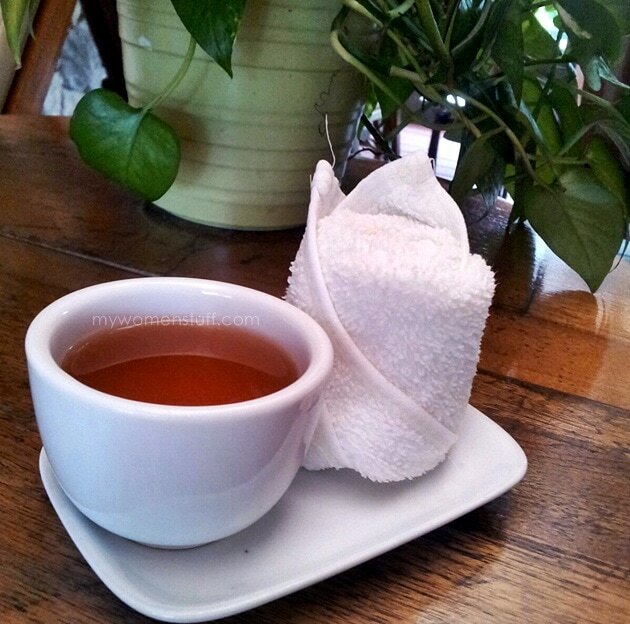 The tea is very refreshing and has a lovely calming effect, while the cold towel refreshes you. 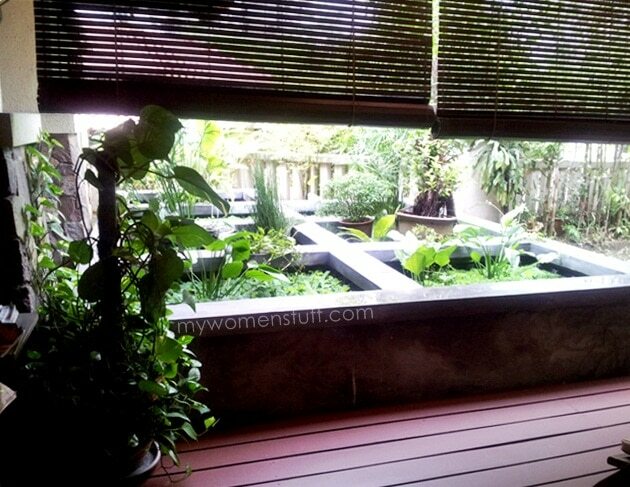 The deck has a nice little bubbling water feature and lots of plants so it feels very natural and comfortable. The condominium swimming pool is not very far, and you can sometimes hear children playing but it doesn’t really disturb the tranquility of the place. This little oasis is what what I enjoy most, as compared to the branch in Great Eastern Mall, as that one feels less relaxing since you overlook traffic, and often, a traffic jam. After a few minutes, the therapists will come and collect you and take you to your room, where you will enjoy your massage. I have gone there twice in 2 weeks (back was really hurting) and both times I had different therapists but the treatment was good. They employ firm slow strokes and if you have a problem with any particular area, tell them and they’ll work on it longer. They are never brusque or rushed, even when it was late, and I feel comfortable enough to return regularly. I must say that the massages aren’t therapeutic or meant to heal muscular problems, but are mostly meant for relaxation. I must say though, that my tight shoulder and back muscles really loosened up and its certainly helped my disposition. After your massage or facial, you are then treated to another round of the lovely hot red date tea, and a warm towel, before you go off and dress to face the maddening world again. I do find that the prices in the Spa menu at Energy Day Spa are a little high (I pay about RM208 for 90 minutes) but it must be said that I have enjoyed each visit as much as the previous one, which is more than I can say for other more affordable spas. Often, I find that the therapists or masseuses in spas aren’t consistent, so it always feels like a gamble each time. Not so here, which is why I’ve made it my massage spa of choice. Do you enjoy going for body massages? Do you have other spas in KL to recommend? PREVIOUS POST: The One Bio-Oil to rule them all : Does it work for me? NEXT POST: Travelling chic with one of my favourite perfumes : Dior J’adore, J’adore travel! Oh Lord! That was a break point for me too! I think consistent services is what’s most important to me. I hate going once, getting a good massage and then never getting a good one again. Sounds very relaxing…and tranquil. I would love to go get a massage once a month. That would be so ideal 🙂 The red date tea sure sounds and looks great! Bet it tastes wonderful! Check out Khareyana Spa in PJ State. I paid bout rm300(few years back) for bout 2+ hrs sPa package. It’s old bungalow turn into spa. Very nice Balinese feel. E masseuse (Noni if I’m not mistaken) was awesome!! I totally can’t live without full body massages! I find that my body aches terribly every 2-3 months, and that’s when I go. Just signed a package with Jean Yip Loft. Love body massages even better if accompanied by Chinese style accupoints sole of the feet massage. I am a spa buff. Thanks for posting this very helpful! If I get a chance to go to Kuala Lumpur I’ll spend a day here. This place looks really relaxing and this place will regain your spirit. Yes, i do love a good body massage <3 But I don't get paid very well, and I kinda invest my money in makeup and skincare (lol!) so I can't afford massage packages. Thanks to websites like Groupon, I had the opportunity to meet with these luxurious spas. Now, I go to spas like twice a month, because I work with computers all day long and a very stressful gal (!) I really do need some massaging now and then. Last week, my company sent me to a conference, and the hotel I was staying was famous with its thermal spa! So, after the conference I booked myself a massage appointment, followed by thermal pool and steam room. Goood, that was a treat! And the best part was, when you leave the spa I didn't go through the traffic, I just went upstairs in my robe, just lay on the bed and fell asleep instantly! I would like to try it one day. A friend lives around that area and it’s good excuse to try it. Thanks Paris! I steer clear of the ones in Singapore as they are usually expensive. I’ve yet to find a good and cheap one. I believe chances are slim. Yes, I’m one who doesn’t blink an eye for a brush with a hefty price tag but would open her eyes wide for Spa trips. Given the good exchange rate, RM208 is just SGD87 so I guess it should be worth it. After all, it’s 90 mins! ^^ Time to relax after a bout of rashes. Oh yes, if you happen to be in Mont Kiara, do give them a shot. Perhaps call ahead so you can be sure they can fit you in. Hope your rashes have cleared up! I just had a lymphatic massage on Sunday at Advanced Beauty Aesthetics (Sri Petaling) and it was really good! Felt all my knots loosened although it hurt the next day. That was one of the best massage I had in awhile! That sounds lovely! Well not the hurting part lol! Oooo… I love body massages! I have to try Energy Day Spa one of these days. The one I normally go to is Thann Sanctuary at One World Hotel. Only been to Energy Day Spa Great Eastern. The manager was telling me the Great Eastern branch has better facilities compared to their MK Branch. There were building works going on across the building where the relaxation room was so not very nice. I think the best massage imho gotta be at Khareyana. My favourites are Anna, Herni & Niyan.